So as the crazy weird reading month of March is dwindling down, I’ve decided it would be out of my best interest to get back on track with my reading. Since before March I have only read 2 books for this entire year… (yes very shameful I know), but March was my turn around point. I was required to read Water for Elephants by: Sara Gruen for a class assignment and dreaded every time I read it. My second book I read was Grasshopper Jungle by: Andrew Smith. The book was quite weird and didn’t fit my interests. My last book I’m finishing up the month with is Divergent! It feels sweet and lovely to be rereading one of my favorite books again, which sparked my motivation to read again, which is the real reason behind this short TBR list for the month. I’ve already planned on reading The Selection and The Elite by: Kiera Cass for my Contemporary Literature class as part of my project. Then after I’m finished with those books hopefully I can move onto the rest of my TBR pile. I’m hoping to read The Statistical Probability of Love at First Sight by: Jennifer E. Smith as part of dwindling down my unwanted/not really interested bookshelf. 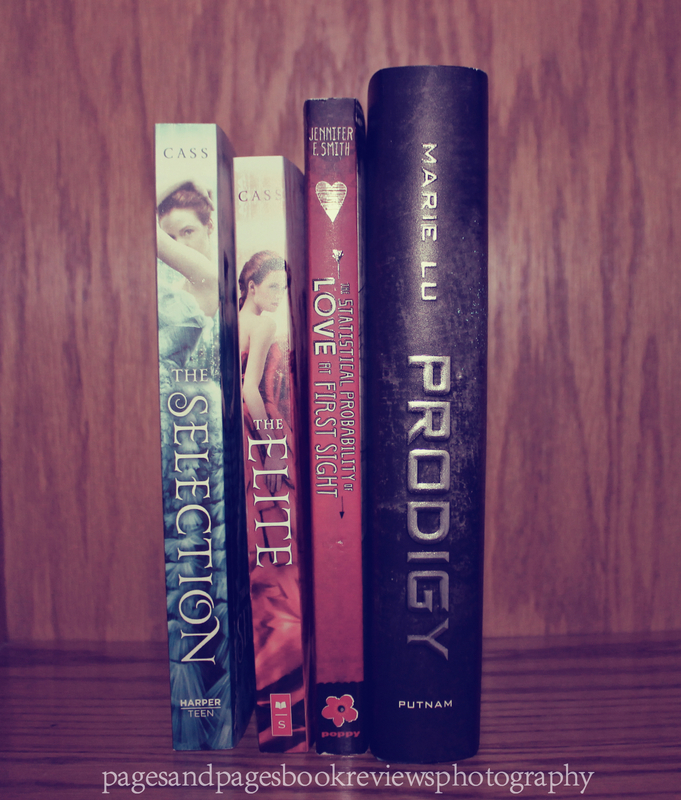 Then the last book I really hope to finish is Prodigy by: Marie Lu. I started this book back in the beginning of February and then slowly gave up on it. The characters and their actions felt like I was reading Insurgent by: Veronica Roth and I just did not want to read about that at the time. Hopefully I can get through this small list as the school year is beginning to end and everything becomes very busy very fast. But I know for sure I will complete my first two books by Kiera Cass! Once I complete them there will be a book review for each, so look forward to that in the future!